I’ve been meaning to get to Wonderbao for ages. I’ve eaten their food before at the noodle night markets a couple of times, but never at the shop. it is a tiny place with a handful of seats lined up at the window. It is notoriously tricky to find, made even more difficult at the moment by A’Beckett St being closed to construct the metro tunnel. Still I found it after a circuitous route around some back lane parts of Melbourne I’ve never seen before, which was enjoyable in itself. 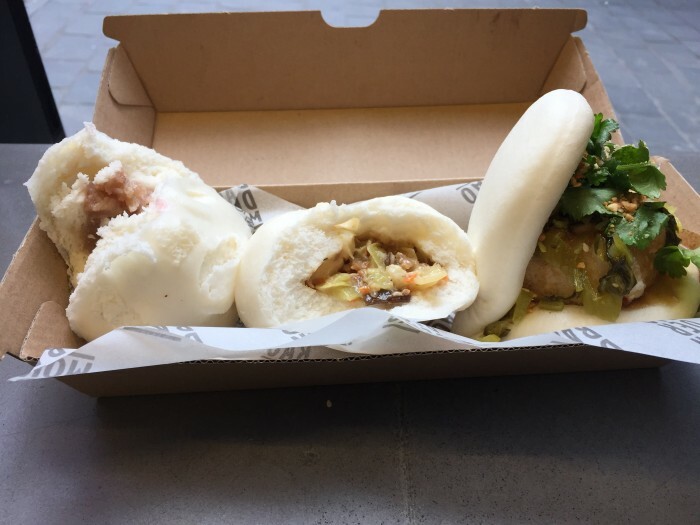 There are a few vegan options on the menu, to save thinking I ordered the veggie pack special, a combination of three items: a crispy silken tofu gua bao garnished with peanuts and pickled mustard, a shiitake mushroom, tofu and vegetable bao, and a taro bao. I have a terror of undercooked eggplant so I skipped the eggplant gua bao, but after seeing someone next to me eating it, I’ll be back to try it. The crispy tofu gua bao was the winner with its delicious combination of flavours and textures. Probably not as great as the slightly cross cultural one at Transformer, but a worthy rival. The shiitake mushroom bao was also delicious, but the slightly sweet taro bao left me cold. I should have known better as I’m not a big taro fan. I’ll definitely be back to try some of the eggplant and the crispy tofu again. It is a great place with quick turnover that is perfect for a quick meal in the city.